This recipe works for traditional elote (on the cob), or as more of a salad, served by the spoonful. If you happen to have a grill, you can grill off the corn, then top with your choice of condiments. Making my version of Elote “Salad” is just as easy. Simply cut the kernels off, or even use frozen corn when it’s not in season, and char it up in some butter. Season it up and mix with the same delicious toppings for a quick and tasty appetizer :) It’d be a perfect side along my BBQ Chicken Without The Grill. When corn is in season, it’s incredibly affordable. Safeway had a sale going on for 8 ears of corn for $2!! Ridiculously cheap. Let’s get cookin! - For traditional elote: Remove the all the husks and silks from the ear of corn. Heat a grill or large skillet. Slather each ear of corn in butter, season with salt or garlic salt, and grill them for 10-15 minutes until nicely browned and cooked thru. Mix up the mayo, crema, or sour cream with the chili powder, juice of one lime, diced jalapeño, and paprika. Spread this mixture on top of the hot corn on the cob, sprinkling generously with Cotija or Feta cheese and chopped cilantro. - Remove all the husks and silks from the corn. Carefully slice off the kernels of corn with a sharp knife. It’s easiest to do the bottom half of the cob first, then flip it over and do the other half. - Seed and dice one jalapeño. You can keep some seeds for extra heat if you wish. - In a large skillet, melt 2 tbsp of butter on medium-high heat. - Dump in the corn and diced jalapeño. Season with salt/garlic salt, stirring often and cooking until browned/charred, about 8 minutes. - Once you dump the corn in the pan, prepare the condiments. 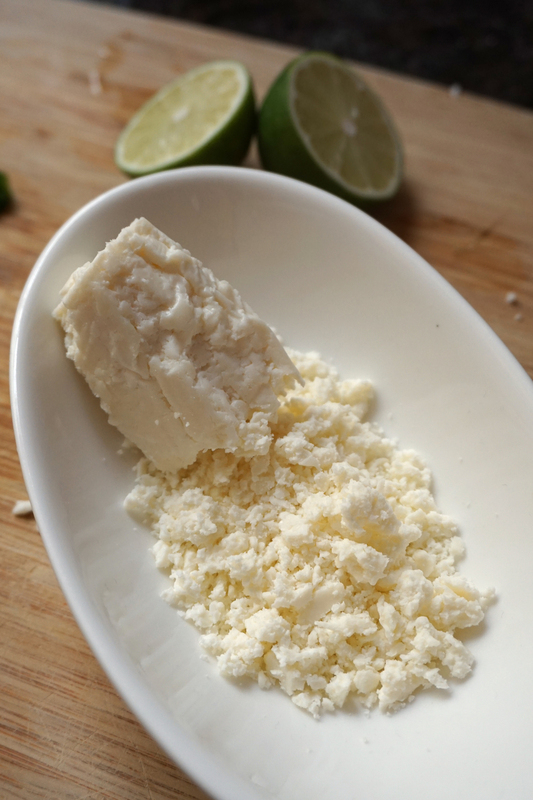 If you’ve purchased Cotija cheese, it normally comes in a large block. It’s a dry and firm cheese that crumbles easily in your fingers, and is delightfully salty. - Mix together 3 tbsp of crema, sour cream, or mayonnaise with 1 tsp chili powder, juice of one lime, and a pinch of paprika. - As the corn cooks, get your serving bowl ready. Wash, dry, and chop a bunch of fresh cilantro. Once the corn is cooked thru and nicely browned, stir in the cream mixture and make sure it’s all evenly coated. Spoon into your serving bowl and top with tons of Cotija and chopped cilantro. Either way, this dish is sooo easy to throw together! Elote Salad is the perfect side dish for entertaining! Cheap, simple to prepare, and a definite crowd pleaser. The combination of flavors is like a serious party in your mouth. I love coming up with creative ways to serve up traditional comfort food :) What are you making to celebrate #MemorialDay? Let me know, I’d love to hear about what your family makes! :) If you’ve cooked any #BrokeAndCooking recipes, tag me in your photos on instagram or twitter @bac_blog! :) Have a great week!